I’m really pleased to be posting that our trip to London to try the Anat Baniel Method was a success! We have seen immediate results and we have plenty of things to be getting on with so all-round happy! I can’t tell you how it felt for us to be told our little one could be helped, had loads of potential, was sensitive, bright and clever. Of course we already know, feel and see this every day…but to hear it from people who could offer us all the chance progression was so warming. We worked on sitting, head control, reaching, rolling, weight bearing down the arms working towards side sitting and rising to propping up on the elbow. Already we are seeing the small person using her right hand considerably more. Previously this was 1/5th – 1/4th of the time compared to the left, now it is easily 2/3rds – 3/4ths of the time compared to left. Her head control is stronger which is very apparent when she is in a back carry. 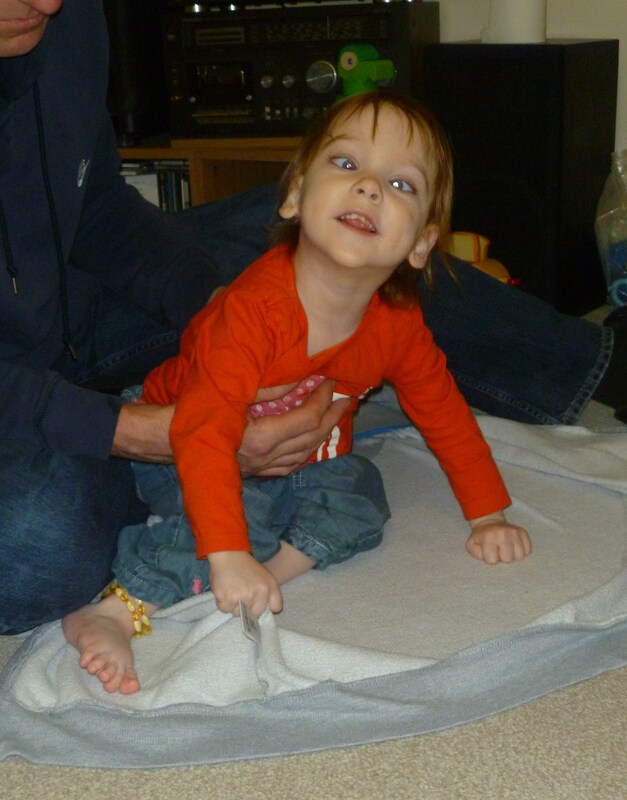 Every day we are seeing more and more weight bearing down her arms and she is very much enjoying the process of learning to side sit. I just can’t believe how fast she is coming along now! So, lots to do now, and we are looking forward to going back as soon as finances allow. The truth is I’ve been quite distracted, what with our upcoming trip and Embrace Art I’m not getting much switch off time. I’ve been doing a bit of crochet to help calm my mind a bit and it must be helping as I managed to crochet one wristwarmer in the space of two naps. Got to get my backside in gear and hook up the other one so I can get them sewn up in time for London. Thats all from me for today, just letting you know I am still here albeit with scattered thoughts! Last week I launched Embrace Art, my simple babywearing artwork venture, you can see it here on facebook. I also have set up a Folksy store although it’s currently empty as I’m inundated with custom work! I’ve got lots of plans to grow Embrace Art although I’m taking it slow as my small one is still quite demanding of my time. All being well we will be going to try the Anat Baniel Method in less than a fortnight. I’m finding my anxiety levels are increasing and some repetitive behaviours creeping in but its under control. Having to cut this one short as my little one is stirring from a very short lap-nap…I’ll be back sooooon!! Well since its been here over a week I think its about time I blogged about my gorgeous Didymos Ginkgo wrap conversion by Fay at Opitai Baby. This stunning carrier arrived on the 21st and I decided against blogging about it over Christmas as I anticipated readership to be down and I want to share it with as many people as possible! So for the babywearing geeks amoung us, the wrap was a size 6 and was converted to a wrap-tai with pleated shoulders, a wrap straps, head rest and rainbow topstitching on the waist which we requested to be 4 inches wide and floppy (so not standard). We went without sear darts as we are now finding they aren’t giving T* the ‘ideal’ seat. In the picture above I have folded over the waist to make the body of the carrier shorter as this carrier is for when T* is a bit bigger. The picture just doesn’t do the carrier justice, it is just beautiful and best photographed in natural light. So, the finer details aside, wow, what a carrier! So comfortable, very supportive and beautifully made…I can’t wait til the drier weather is here so we can really try it out! Huge thanks to Fay at Opitai Baby for your amazing work! And on the subject of babywearing, I’m looking into setting up a Folksy shop to sell some simple babywearing (and other) artwork. Watch this blog for a link…. Sending lots of festive blessings to my lovely readers and followers! We had a lovely quiet family celebration yesterday with gift giving and a meal. Our small one had great fun unwrapping everyone’s presents and then discarding them in favour of tearing the paper. I would liked to have crafted more presents but free time and free hands are a non-existent commodity in the winter months for us. Maybe I should think about crafting in the Spring? We opted out of ‘doing’ Father Christmas as it doesn’t sit comfortably with us but of course we’ll have to see what happens next year. I am also interested in researching Saturnalia, Yule and Winter Solstice and seeing how that influences our future celebrations!! …And I’m still not ready! But I’m not to worried, the world won’t come crashing down if a few gifts don’t get to their recipients on time! This year winter solstice falls on the 22nd December and if we get the chance we’ll do something small to mark the occasion. I have to confess to be addicted to needle-felting. I bought a kit from www.handspinner.co.uk and I’m loving it. Disaster struck on Friday when I managed to break a needle…cue a mad scrabble to order more needles in time for the Christmas postal standstill. I’m managing to get a bit done while little T has her daytime nap in my lap. I’ll post photos of my progress soon. 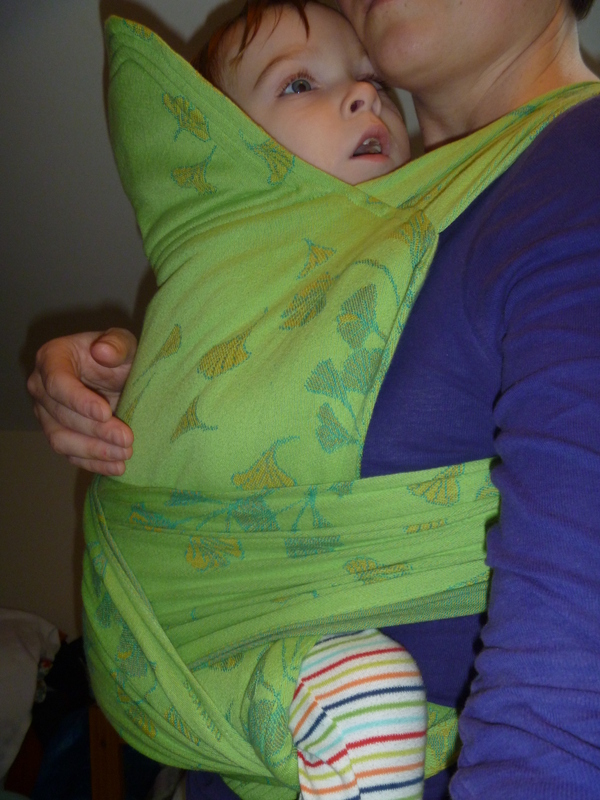 Our Didymos Ginkgo wrap was converted on Saturday by Fay at Opitai and I am so excited! I’m anxiously awaiting photos via email to cheer up this miserable winter day…EEEEEEEEEEEEK!!! Lol! ….And I’m back! Sorry for being so quiet lately, I can see by the site stats that BCB is still being visited regularly so its nice to know people are still reading. Well, things have been busy and my head has been full. I’ve tried to blog several times but given up because my mind being blank. Winter is here, my body and brain are slowing down, but enough of that! I’m back and I promise to be better. So what’s been happening? No much actually. The small one is keeping me busy, she has just completed a block of speech therapy where she was introduced to a picture system as a method of communication which she picked up really well. We’ve also had an OT assessment and were told we are doing everything they would suggest. It’s so reassuring when the professionals say that! The physio’s application for a walker has been approved but we have to wait to find out if there is any funding left for this financial year…if there isn’t we’ll have to hang on til April. We haven’t been able to spend much time outside now it’s turned cold and wet, but I’ve recently discovered ringslings which is making life much easier indoors. We have a Storchenwiege Lilly and also waiting on hearing about a Neobulle Julie as we really need two on the go! We also sold our Rose & Rebellion SSC and got a petite toddler Girasol Wompat in Forest Berries as I needed something in a smaller fit. Forrest Berries is soooo pretty, I’ll have to get some pictures sorted so I can show it off to you. Not only that but our beautiful Ginkgo has gone off to Opitai be converted into a wrap-tai! I’m a bit nervous at the thought of it being chopped up but really I can’t wait to see the result…watch this space! !